This elegant and unique tropical floral arrangement is perfect for your special Love. The unique White Ceramic Container with Gold embossed hearts sets the perfect tone for this gorgeous arrangement that envisions the spirit of Love and Romance. A stunning full stem of Cymbidium Orchids shares the spotlight with Crimson red roses and deep red Hawaiian Antherium. Tropical leaves frame the arrangement and lend depth to this elegant design. Flowers and colors subject to availability. Substitutions may be made. 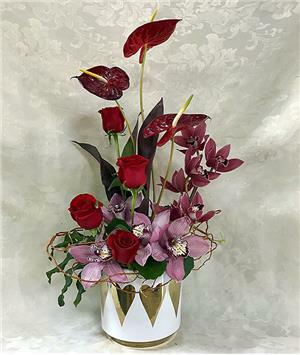 The Tropical Romance Bouquet is created in a white ceramic vase embossed with gold hearts, styled with a stem of mauve cymbidium orchids, red roses, deep red antherium, ti leaves, fatsia, galax leaves.